Firefighters from three agencies battled a blaze at an industrial warehouse Monday. It wasn’t gas lines, a guy was handling a propane tank when the valve broke. I wonder what the story is? Old gas lines? On the 29th, there was a scary fire in downtown SLC. “They eventually found fire in the basement. A hole was burned through the floor and fire was coming up from the basement,” said Capt. Mark Dednarik, Salt Lake City Fire Department. This afternoon there has been a gas leak near the homeless center, at the 4th Street Clinic. That prompted an evacuation. About 5 PM, the sky got black. I could not see the mountains. Then it started pouring. Less than half an hour later, we had blue sky and sun. During the hardest rain, there were many, many sirens. I thought maybe the homeless place got worse. On the news they said it was a bunch of bad accidents on the interstate….all at once. Soon the rain and clouds came back, though. Ah! Spring! Examples of self-contained sinks, with fresh water, gray water and hand pump faucets. Last time I roamed the earth, I bought bottled water to drink because I did not trust the water in campgrounds. 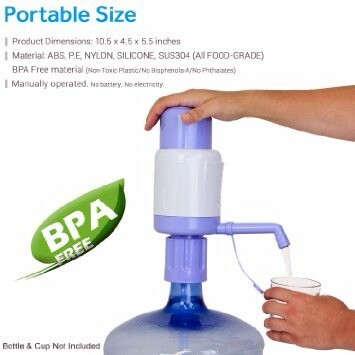 I would rather get a 2 to 6 gallon spring water jug, put a hand pump on it and get my drinking water that way. One guy bought a shower base, put a 15 gallon plastic drum under the frame, and the shower drains directly into the drum. Cheap and easy! I just happen to have two dressers and a small table that match. They will work perfectly for my pretend RV. If it’s a high top, the 2 dressers can be stacked and bolted together. Two phone calls today. The first was from process servers. They have left many messages for “Mary”. When I got a real person today, I told them to quit calling me. The guy hung up while I was still grousing at him. The next call was absolutely and totally unexpected. The Rehab Medical guy, who dragged out me getting my wheelchair for 9 months, called. At first I could not talk well….but then adrenaline hit. He said he has been off working all over UT and NV, but is now back in SLC. He claims he is here for me and will get the tilt mechanism OK’d and the power wheelchair all fixed up. I was honest with him and said I had been talking to another company. I am pretty darn sure he already knew that. I suspect that’s why he suddenly came out of the woodwork after 3 years. I am guessing that Medsource contacted my insurance after I gave them a copy of my insurance card. And I am thinking the insurance company heard an earful about Rehab Medical jerking me around. It’s no coincidence that a company who has been ignoring me a very long time, just happened to call today. I also suspect it’s because I told the corporate office that if they charged my insurance for a new headrest or armrest that I never got, it was fraud. But….he is saying it will take 4 to 6 weeks to all happen. Seems like that’s what he said when it really took 9 months to get my chair :-p Interesting development, huh? You know what else is interesting? I have not had night sweats since taking diflucan! I celebrated today by changing the sheets. I hate changing sheets with a passion. The 2 hardest things for me to do are take off and put on sheets and pillowcases….and do laundry. It took me all day, bit by bit, to do the darn bed. I think it’s about time to go try out my handiwork. Zzzzzzzzz……..
Maybe it was better when I didn’t know?!?! Yesterday, by email, I got a crime update about the SLC area. Geezum crow! Here is the Crime Update you’ve requested for today, February 05, 2015. This update includes all incidents added to the map since the last update you received. Last night I couldn’t sleep because the itching was so intense. I finally took a shower, using no soap, at 3 AM, to try to calm it down. It helped a little. As I sat here, drying in the breeze, it was scary listening to all the commotion outside! Lots of screaming and strange noises not too far from my window 😮 As I am typing right now, I can hear all sorts of sirens. Part of it is having my window open after a few months of winter. I am not used to all the sounds of the city. In the middle of the night, I watched The Bus….a documentary about VW buses. Ahhhhh….brought back memories. My own kid has had a Vanagon and a Eurovan. My family had an old VW camper. There is still a picture kicking around of me on Prince Edward Island as a child, standing by the VW bus. I have to admit, I was NOT a fan of how my mother drove the thing! She would purposely go over bumps so we would fly in the air and hit our heads. She also loved coming up fast behind cars, then slamming on the brakes. It always looked like we were already in their trunk. One good thing about my father was his driving. I wasn’t scared with him behind the wheel. I didn’t like sleeping in the VW bus! I was assigned the space across the front seats. It hurt. My brother was in the hammock above me and he drooped down into my space. My parents got the real bed and my sister slept over the back engine. As soon as I was able, I got my own tent and slept outside. I thought the VW camper was cool, though. I liked all the cupboards and the little closet. The door opened up, a shelf came out, and that’s where cooking was done. I read various versions of the Compleat Idiot book over the years. I used it to rebuild my VW bug engine and the carburetor one winter….in my second story bedroom 🙂 And yup….like the documentary says, I met the best people while broken down! Well, except for the AAA tow truck driver who accidentally dropped my VW in the middle of an intersection, then got mad and drove off, leaving my dog and I to figure out what to do next. Once I hitched across most of the US in one ride. I got picked up in a VW bus in Missoula, Montana and was left in Wilkes-Barre, PA. It was Christmas time and I was cold, so I bought a bus ticket the rest of the way to Syracuse, NY. My latest big adventure was wearing the new CPAP doohicky. So far, I have mixed feelings. I slept great when I finally conked out. When I awoke from a full bladder in the early morning, I tried going back to sleep later and felt suffocated. I switched back to my old one for the remainder of my sleep. I will try again tonight. I think I just need to get used to it. The new mask smell made it hard to breathe. The next time I woke up, it was wth body altering hand and leg cramps. Never ceases to amaze me how much a muscle spasm can bend my hands 😮 I miss having Heather to flatten my hands for me. Those suckers get stuck that way! And it HURTS!!!! The high today must have been near 70. Nice 🙂 I went to Radio Shack to trade in my wrecked iPhone cord for a new one. I heard they filed for bankruptcy, so I figured it might be now or never. I had bought their protection plan. The cord is for Heather. One can never have too many cords. I can see Radio Shack from this property, so it wasn’t much of jaunt. I came home and rested. My guts aren’t happy. This afternoon I was sort of OK. As soon as I tossed the garbage and recycling in the dumpsters, my voice got broken and my eye drooped shut. Why don’t I ever think of that BEFORE it happens? That tendency is probably what keeps me sane. If I worried about every pain and kind of disability that might happen next, I would never do anything. The folks who heard my good voice yesterday were perplexed today. It’s hard for people to understand that it switches back and forth in a blink. And one minute I look OK, and the next, my eye is closed. I just got a postcard in the mail saying it’s time for Olive to get a 3 year rabies shot and a FVRCP booster. Sigh…. I should have robbed the bank on my way to Radio Shack. It’s a popular thing to do in SLC. Now I understand why. I did the personality test for the bazillionth time. Now I am an INFP. This morning I went to the park for free food. Very slim pickings. I got a star fruit, some bananas, 3 blueberry biscuits, 4 flourless apple cinnamon muffins and a wheat garlic bread. Oh…and a cupcake to eat on the way home. I cannot figure out what my problem is. I feel mildly yucky, very tired and like I just want to sit here and cry. If I have any hormones left, I’d guess they are out of whack. It’s too nice outside to feel so weird! Maybe I will go take a nap and see if that helps. Ha….I decided to FORCE myself to go outside. I went to the library to borrow volume 9 of The Work and the Glory. I am almost done with 8. They didn’t have it. 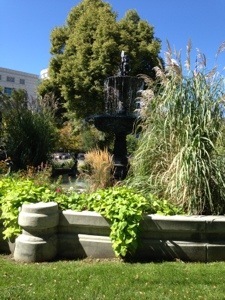 So, I went across the street to a park and played with my phone and read. Wow! My phone works much better in the park! I was wondering if there was something wrong with it. This new phone runs on Verizon. The last one was Sprint. Both are through StraightTalk, but for some reason the Verizon signal is weaker. The cell tower is only 2 blocks away. Geeze. I was only in the park about half an hour before I got cold. I had even worn a long sleeved shirt. After the blazing hot summer, it’s nice to be in the 60’s, but I haven’t acclimated yet. No matter what I do, I am in pain. I tried getting in bed, sitting in my chair, reclining, hunching forward, standing, moving….it all hurts. I have been restless all day. Going anywhere in my power chair hurts, too. Oh, ba humbug! It has been 100° day after day after day this summer. If it’s not 100°, it’s 98 or 99°. I read lots of RV blogs. They are torturing me with gorgeous pictures of blue lakes, very green trees and flowers everywhere. Then they brag about moderate temperatures during the day, with cool nights for sleeping. Ahhhhhhhh…..
OWIE! OUCH!!!! HURTS!!!!!! Everything the nurse did was painful. He claims my nerves are growing back fast…and that I will be healed in no time. The wound is down to only 15 cm across. That sure is a miracle! My belly wound used to be big enough to swallow up children and small pets. That darn Dakin’s solution stinks and stings. I hope I never have to smell the stuff again once my wound heals. Whiffing it 24/7 for weeks on end is just plain gross. My head hurts. The nurse says I am dehydrated. As usual, I had night sweats all night long. The humidity is 16% and dropping fast. We are under both a fire watch and warning. On the other side of the mountains by Big Cottonwood Canyon, there is a fire near Park City. I think Utah has 7 major wildfires right now. Ohhhh….how I long for raindrops and lushness. Too late for Vermont, though…we generally got our first frost by next week. I decided it was dark and cool, so I would go look in the RV to make sure everything is OK. I have a little step stool that I have used with my vans and RV’s. I can’t do stairs, so this helps. To get up on that step stool, then into the RV was about like climbing a mountain. I was soooooo weak! I wasn’t sure I was going to make it inside. Coming out again was at least as bad. I guess things have to be proven to me over and over. I am too weak to get in and out of the RV, and am definitely too weak to drive. That brings me back to the whole vehicle conundrum. Should I really try to get a handicapped accessible van? Will I be better when my belly wound is healed? Will I ever get another IVIg and regain some strength? I feel horrible after going outside. I stressed out my belly and now it stings and itches and hurts deep down inside. Day after day and night after night, I dream about camping and going off on adventures. Will I be able to again? My phone is making me crazy. It likes to turn off and on…over and over and over… Today it hung up on the wheelchair office person. Last night it charged 6 hours and only got to 26% charge. Like I said…I think there is a short. Sometimes it makes a zzzzzzttttt noise when it zaps off. I had to take the battery out, put it back in and let the phone reset so I could write this post. Several times today I wanted to fling the phone across the room. I feel like flinging me across the room, too! My body doesn’t work at all the way I want it to. I feel useless sometimes. Then today I got an email from my bishop. He says I am the most courageous woman he has ever met. Me??? Really??? He must see something in me that I don’t! I am procrastinating again. I don’t want to go to bed and be sore. My wound vac is working overtime. I strained my belly too much and lots of wound juice is coming out. Eeeeeew!!!!! I have been trying to study up about different kinds of housing. Basically, the cheaper it is, the longer the waiting list. If you have never been homeless or poor, you probably believe the fairy tale about a “safety net”. Each year there is less of one. At this point there are way more holes than net. I was actually very blessed to have found this apartment. It was suggested to me by a social worker at LDS Services. She said it was nicer than most and had a short wait time to get in. At that time it was $495/month, including utilities. Now it’s $505. As usual, I am one of the poorest ones here….just like I was in the Adirondacks. Since I was disabled young, I didn’t have enough work quarters. That means that for this year, I get $710/month for being disabled. I am grateful I get anything. The challenge is to live on that much money. I have talked about that a zillion and one times. It doesn’t matter how you slice or dice it….it’s just not enough. I read lots of van dweller and RV’ing blogs. Most people’s lives wear me out just reading about them! Lots of driving, hiking, going out to eat and shopping. One blog today put up their monthly expenses. It was @$5,000/month for two people. Wow! Most of these successful folks have been very lucky to have had good health and the ability to earn decent money. My reality would be unthinkable to them. I know, I know….when life gives you lemons, make lemonade. I am extremely grateful that I had the gift of time all these years. Time to sit in the woods, time to unschool my daughter, time to read, time to think. I went to college for a lot of years. I studied many things and I usually studied hard. I dropped out a few times due to medical issues, but I kept going back until I got my degree. I had no idea that the health stuff was only going to get bigger and bigger. Sigh…. I didn’t have a clue that I would one day be a senior who lives way below the poverty level. Today I was going through the newest edition of Seniors Blue Book. It comes out twice a year for Utah. I wish there was one for Oregon. Somebody needs to buy that franchise! As you can see, not many states publish this book. The chart showing senior rentals in Salt Lake County is very helpful once you learn the lingo and acronyms. Darn! It’s not on their internet version, so I can’t show you. There are places marked subsidized, income based, public housing, income restrictions and tax credit. There are only 3 buildings listed eligible for the tax credit, and this is one of them. All I know is you have to be older than me to get it, and you have to live in the apartment for a full calendar year. I am at an awkward age and stage. I can live in some senior housing because I am disabled. (the Adirondacks) Here I am eligible because they count 55 and up as seniors. At the senior center a couple of blocks from here, you have to be 62. Some senior apartments won’t let you in unless you are 62. I keep saying I need to go somewhere and use a real computer. Too bad most free computer access is under fluorescent lights 😦 It drives me absolutely batty to try to research Portland apartments on this tiny Android screen. I have made a few enquiries with zero results. I guess I have just enough time and health to leave me frustrated. I want to do more, I mean to do more…..
At 4 AM the leak alert began beeping. No amount of poking at my belly or jamming a pillow into the belly pit would shut up the alarm. I got up and sat in my comfy chair. About every two minutes the leak alarm beeped and I would hit reset….over and over and over. I texted the nurse who woke up sometime after 7 and was here by 8 AM. He was ready to rip the wound dressing out, then got it to seal. I had to hurry because I had an appointment to get my port flushed at the hospital at 9:30. That meant a quick sponge bath and clean clothes before wheeling 3 blocks up the road to get on TRAX. Ohhh…forgot to tell you what I was doing to take my mind off the #$%&*!!! beeping machine. Last time I changed the sheets, it hurt my belly. This time I moved the entire bed away from the wall so I could find a piece of my CPAP that fell off. Then I vacuumed underneath….and the whole apartment while I was at it. I re-centered the foam on top of the bed. Since I now had access to all 4 corners of the bed, it was much easier to put the new fitted sheet on 🙂 Ahhhhh…that felt better…for a few seconds. Then I was wicked sore. Of course that’s when the nurse showed up. I was all hot, sweaty, bent in half and barely walking. Yup, he gave me heck for doing too much. All that work produced extra wound juice. At the hospital, the nurse there wanted to know what my port was for. I told her I have MG and get IVIg. She said, oh!!! we give that to lots of people here! I briefly told her the sad story of meeting the idiot neuro, but my hope that the nice neuro I met while hospitalized would agree to IVIg once my belly is healed. We had a grand time yakking away. Once she unbuttoned my shirt and got my undies out of the way, she started speaking Mormon. She apologized for getting disinfectant on my garments. Back on TRAX and then I got off at “Trolley”. That means it’s near Trolley Square. I toodled over to Trader Joe’s to mostly window shop, but got strawberries, cherries and kefir cheaper than Smith’s. Then over to Smith’s for onions, an avocado and some frozen green chiles. Got home to find the barriers down. The parking lot was all cured and re-striped. Hardly anyone had moved their vehicles back. It was past noon and I never did have breakfast. I was too hot and tired to cook food, so I made a strawberry banana smoothie. Once my body cooled down enough and I had a smidgen of energy, I got up to make a casserole with hominy, sour cream, cheese, green chiles, onions, bacon bits and seasonings. After eating, I napped. Oh, my gosh! I thought getting in bed and lying down was going to be great. Instead, it was torture. It took about 45 minutes for my body to stop hurting enough so I could fall asleep. All of my long bones ached to their cores. My joints were crunchy and wicked bad painful. I know I overdid…but geeze, not that much! I woke up at 11 PM, soaked from nightsweats and with a killer headache. I am glad the only thing on the agenda for Friday is the visiting nurse for wound care! It was a wonderful 68° this morning. I figured it was perfect for moving the RV. Everybody has to get their vehicles out of the two lots today so the paving company can come in and resurface. Geezum crow! You’d think I just ran a marathon! I am sooooo sore and out of breath 😦 It made me wonder all over again if I will ever be strong enough to drive. Yup….that got me depressed! Lately I just don’t feel well enough for anything. I need some fresh fruit, but there’s no way I have enough strength to go get any. Also, the bishop is going to get me some, I just don’t know when. Last night, as I tried to get comfortable, I brushed my right jaw with my arm. There’s a lymph node or something all swollen up and sore. Just great! As I suspected, the MCTD bother is all coming back, too. Bah…humbug!!!!!! I don’t want to be sick!!!! Yesterday and today, the forecast said 50% chance of rain. That was great because we had cloud cover….and that brought the temperature down to 70’s. In the evening, I finally took the garbage out. There was a pleasant breeze, so a bunch of us sat outside talking. What a relief after so many 100° days!!! After awhile, I decided to go to Arctic Circle for their 79¢ ice cream cone. Big deal for me! 🙂 It’s about a block from here. By the time I went to bed, I was actually tired. When the stupid wound vac alarm went off at 3:15 AM, I seriously did not want to wake up! It said there was a big leak. I couldn’t find it. But….if I pressed on the drainage hose hard enough, the leak would slow down. Then I got too tired and went back to bed. I dreamed interesting stuff about wheelchair accessible RV’s. BUT…I could only sleep in half hour stretches. I had to cram a pillow into my belly and sleep with my legs drawn up tight. Eventually my body would get such bad cramps that I would stretch out…and the alarm would go off. Other times I have been able to patch up leakages. This one is a mystery. I texted my nurse at 4AM and 7AM. He said he or another nurse would come fix it. I did drink down a banana blueberry smoothie 🙂 I sure hope my aversion to food is fading away. I think it’s about time I tell my bishop that I need a food order. I can get meat, fresh fruits and vegetables from the church to help stretch my meager resources. Yup…it’s time. He told me to let him know when I need it. I wish I had thought of this earlier….there’s a radio in my closet. I should get it out. I am so used to quiet that I never think of listening to music or talk. No TV here. No internet except on my cellphone. Sometimes it’s too peaceful…. I was already in menopause when my uterus and ovaries were yanked out of me. It shouldn’t affect my hormones, should it? I don’t know what to think of my moods right now. I got grouchier when I got the cooties, but I think it’s more than that. Well…I doubt if most people with a gaping belly and a wound vac attached 24/7 could remain cheerful! It’s getting to me. But really, it feels like something weird is going on with my moods. Not exactly like PMS, but similar. Too much up and down! I suppose part of my problem is that I can think better, and I feel like too many things are unsettled. I have waaaay more questions than answers. I am torturing myself with the”what ifs” and “what’s next”. No matter how hard I try to drink plenty of water, I have been dehydrated for quite awhile now. The nurse keeps pointing out all the fluid I lose thanks to the wound vac. I am acutely aware of the drenching night sweats every time I fall asleep. Add to that diarrhea and even my runny nose, and it seems I am losing fluid left and right. I am awake for just a short time (I hope). I woke up at 4 AM, too sore to keep sleeping until I took my Mestinon and Motrin. I also woke up parched. I can tell the darn dehydration is contributing to these weird headaches. All night I dreamed I had a home-made RV and was traveling around in it. The sucker had a BIG door for my power wheelchair!